According to Michael O’Fallon, who is one of the most well-connected men in all of the Reformed theological world, he had a front row seat to how this bizarre relationship between open-border zealots and Southern Baptists began. According to the podcast below, O’Fallon explains that there was an intentional decision by the Evangelical Intelligentsia to promote illegal immigration and dismantle sovereign nation-state borders in order to capitalize on what they say is the one segment of American evangelicalism that isn’t shrinking…ethnic minorities. Coveting church growth, men like Russell Moore have made the cold and calloused decision to lock arms with George Soros and follow the path of Roman Catholics, who have seen some success in retaining Hispanic followers by opposing immigration law. Russell Moore has chosen to promote a thoroughly political ideology (the end of national sovereignty) for the sake of church growth. While listening to O’Fallon’s explanation of the evangelical partnership with Soros, I repeatedly acknowledged the validity of Pulpit & Pen’s Seth Dunn, who has time and time again argued that the appeal to immigration lawlessness is financially motivated, looking at demographics and deciding that Caucasians will not be able to keep evangelical institutions (like the SBC) afloat in coming decades. As the links above demonstrate, the National Immigration Forum is directly funded by George Soros. Its initiative, Bibles, Badges, and Businesses, is an explicit strategy to get evangelical churches (Bibles), law enforcement (badges) and corporations (businesses) to coalesce for the purpose of ending national sovereign borders. Beginning with Richard Land, then president of the ERLC, and followed up by Russell Moore, Southern Baptists have been a part of this sinister strategy from the beginning. Continuing the strategy of turning evangelicals into a leftist voting block, commandeering the Moral Majority for the sake of the Democratic Party, Russell Moore is again partnering with the National Immigration Forum and will be speaking at an upcoming conference. Russell Moore is one of the keynote speakers. Notice that Lifeway Executive Director of Research (Ed Stetzer’s old gig), Scott McConnell, is also speaking. 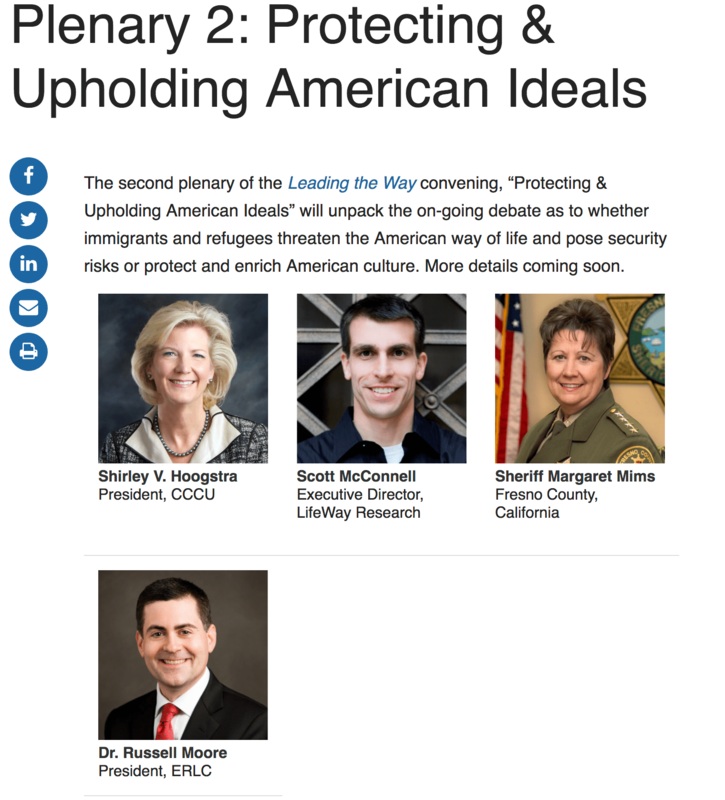 Shirley Hoogstra, the President of the Council for Christian Colleges and Universities, is a longtime supporter of illegal immigration and also serves on the Soros-funded Evangelical Immigration Table, a sub-organization of the National Immigration Forum, a sub-organization of Soros’ Open Society Foundations (as the links above demonstrate). Margaret Mims is the Sherriff of Fresno County, California, and made waves for rejecting Trump’s proposal to have federal immigration officers deputize local law enforcement. Mims said that her department would not be asking people for their immigration status. While rejecting the idea of “sanctuary cities,” Mims has also rejected the idea of her department enforcing immigration law.